Educational Qualification – Candidates who have degree /Diploma in Engineering in Civil/Electrical/Mechanical trade from recognized institute/college with relevant experience in related field. will be considered for this post. How to Apply for SSC Junior Engineer Recruitment Online Form 2019 : Candidates need to apply online from the link provided below or they can also apply through official site of the SSC before 25/February/2019. Note : Candidates are suggested to read the official notification regarding post wise educational qualification & experience before applying. 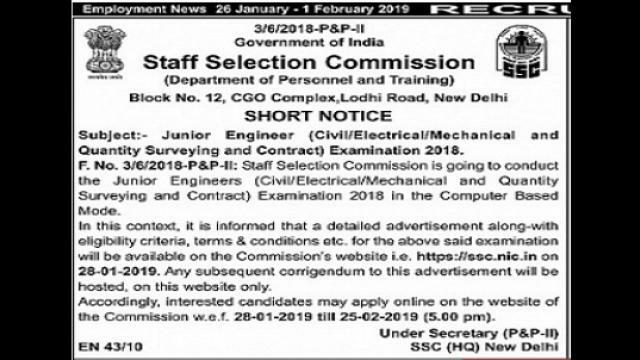 About – In a recent notification Staff Selection Commission, Department of Personnel & training has announced the Recruitment of Junior engineers in Civil/Electrical/Mechanical trades .Candidates having Engineering Degree/Diploma in Engineering can apply for this hiring. Online registration process will be started from 28 January 2019 till 25th February; 2019.Candidates can go through the above mentioned details before applying. Introduction – Staff Selection Commission is the Commission made under the government of India for recruitment of various Job Roles & Services under various ministries & Department of Government. Sir mane abhi BA 3yr ke exam diye isi year..
kya me SSC CGL form apply kr sakta hu …..
No,for 12th pass students their is another exam SSC higher secondary level exam,keep visiting our site for new updates. You can retrieve your registration number by clicking on Forget Registration Number . After filling up the essential details, the registration number will be sent to your registered email id. Check your email id (Spam Box)for registration id and password. Ssc cgl tier 1st ka exam kb hoga nd admit card kb niklege…. We will update the details as soon as the official confirmation is released by SSC. SSCJE 2019 KA FARM BHARNE PR OTP NAHI AA RHA HAI OUR PURANI MPROJGAR PANJIYAN ID ME PASSWORD BHI NAHI LE RHA HAI. PLEASE SSC JE 2019 KI FARM FILL UP DATE BADAYE.